In many ways, our modern age has become more casual than ever. People wear jeans to church. Kids greet adults by their first names. And meals often consist of fast-food, which doesn’t require utensils. While I certainly do not wish to return to the formalities that Downton Abbey has made famous, the truth is I would like my children to have good manners, but I’ll be the first to admit I’m not sure what to introduce or enforce when. 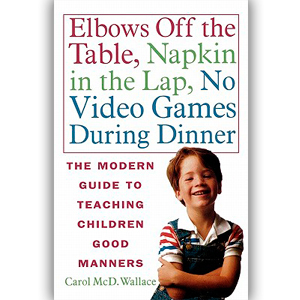 Therefore, this month I’m blogging about Elbows Off the Table, Napkin in the Lap, No Video Games During Dinner by Carol Wallace. What I love about this title is that it’s a step-by-step guide that’s broken down by ages. In other words, I can turn to the section on “The Age of Reason” to find out what to do about my 8 year old, who still forgets to use her napkin, and then flip to “The Young Sophisticate” for how to advise my 11 year old, who still forgets to offer her friends food and drink before serving herself. Now, of course, the book builds off of the “dawn of civilized behavior” and I’ll admit I read through “The Basic Training” for children 3 to 5 just to make sure my kids had mastered them. For the most part we were on track. Wallace wrote this book because she believes parents are having a hard time defining politeness since we live in an age that’s discarded old-fashioned behavior. That’s why she’s provided a gradual introduction to the new habits. Everything from how to greet people to telephone manners to audience participation is repeated, increasing becoming more complex as your child ages. I’ve always been a stickler when it comes to meeting people, never allowing my children to play too shy to speak, believing as Wallace does, that it’s rude behavior. And when it comes to playdates and table manners, I pretty much know what I have to nag them about. Therefore, the part of the book I’ll be turning to the rest of the month is “Good Housemates,” for picking up after themselves is not my children’s forte. Thankfully, Wallace recognizes that many of us will look at her lists and think there’s no way we could get our kids to do these things. She writes, “I wouldn’t be able to either. Not all of it. There will be things that just don’t take. I am still, in spite of all my efforts, quick to interrupt.” Since I could relate to the interruptions in particular, I knew exactly what she meant. What Wallace wants readers to take away from her book, however, is that our children can learn most of it and that we’ll be glad once they do.